But they are also found in Guinea, Ghana, Togo, Nigeria, Cameroon, Congo, Kenya, Tanzania, Central African Republic, Sudan, Uganda, Zambia, Malawi, and Zimbabwe. The Gaboon viper preferred types of habitat are the sub-Saharan tropical rain forests and woodlands on the fringes of these forests. They are found for the most part at the lower altitudes, but sometimes they can be found as high as 1500 up to 2000 meters. The species is mostly nocturnal. The species is also commonly known among other names as swamp jack, butterfly adder, Gaboon adder or forest puff adder (not to be confused with the puff adder). The Gaboon viper is not only the largest member of the genus Bitis is also the heaviest venomous snake in Africa. It reaches lengths up to 1.8 meters (6 ft) and can weigh up to an excess of 20 kg in some cases. Their massive weight surpasses even that of the Eastern diamondback rattlesnake the largest rattlesnake species, making the gaboon viper the world's heaviest venomous snake. The gaboon viper presumably lives for about 18 years in the wild. It features a large triangular shaped head that tapers into a narrow neck and their large and thick body. Females are generally larger, and heavier than male snakes. Among the venomous snakes, they feature the largest fangs, the teeth of an adult Gaboon viper can measure about 5 cm (2 inches). The West African Gaboon viper (Bitis gabonica rhinoceros) subspecies has something like a pair of "horns" situated between the nostrils. It has a very characteristic brown band on the head. The body is pale, with tan markings, beige and yellow, which gives its excellent camouflage against the forest floor and fallen leaves. Their midbody dorsal scales are strongly keeled while those the outer rows on each side of the body aren't. 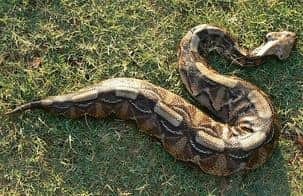 ​Currently, there are 2 subspecies recognized by scientists, including the nominate subspecies East African Gaboon viper (Bitis gabonica gabonica) and the West African Gaboon viper (Bitis gabonica rhinoceros). East African Gaboon viper (Bitis gabonica gabonica - Bibron & Duméril, 1854) - Found in several countries of Central, eastern and southern Africa. West African Gaboon viper (Bitis gabonica rhinoceros - Schlegel, 1855) - Found in West Africa. The western subspecies is sometimes considered a separate species (B. rhinoceros). The Gaboon viper inoculates a highly potent venom to humans and other animals. The venom itself is not considered particularly toxic if compared to that of King Cobra and Black mamba. The Gaboon viper venom is cytotoxic, this means it attacks and destroy cells and tissues. It is injected in large quantities due to the large size of the glands that secrete the venom. They are considered extremely docile snakes and do not usually attack humans unless they are seriously provoked, if they feel threatened, they may hiss loudly as a warning. They produce the largest quantity of venom of any venomous snake. The venom yield is probably influenced by the size of the snake and ranges from 200 up to 1000 mg of dried venom. The length of the fangs up to 2 inches, results in the venom being injected deep into the victim's body. Gaboon viper bites on humans are relatively rare, people are often bitten when they accidentally step on the snake, even in that case this species rarely bites. Their bite causes swelling in the bitten area, intense pain, severe shock and local blistering. Other symptoms include the drop in blood pressure, nausea, disrupted vision, convulsions, unconsciousness, and internal bleeding. Local tissue damage may require surgical excision and possibly amputation.The healing is slow and fatalities have occurred during this recovery period. Their diet consists mainly of birds and mammals, but they also eat insects and rodents. An adult Gaboon viper is capable of feeding on a full grown rabbit. They usually catch their prey in an ambush style using camouflage, instead of actively hunting down their prey. Unlike other vipers, they will strike their prey and hang on to it using their very large fangs rather than releasing it and wait for it to die. During the peak of sexual activity in the mating season, male snakes will engage in a form of ritualized combats against each other.Rubbing their chins against each other, one raises the head high, the other one does the same and they intertwine their entire body. Females may breed only every 2 to 3 years, or even in intervals up to 5 years.The gestation period takes about 12 months and they usually give birth in late summer. The Gaboon Viper's newborns are about 30 cm long and weigh between 25g and 45g. It is a viviparous snake species, which means they give birth to live offspring, in this case about 8 to 43 at a time from those about 24 will survive to adult age. 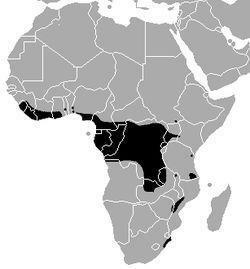 The IUCN has yet to assess the gaboon viper for the IUCN Red List. When they are young Gaboon vipers have many predators including lizards, birds, and even fish or cats, but like other snakes, their most dangerous predator are the human populations that share their habitat. Gaboon vipers are killed by humans out of fear and also for their meat. However, these snakes are not considered to be threatened in the wild. Found in the South American rainforests the green anaconda is, by weight, the largest snake in the world.